Our original plan for an activity at the coast was a (half) day of sport fishing. However, the company we were planning on going through received pretty bad reviews and the other company we found already had a private charter booked for Saturday and was not doing a fishing trip. 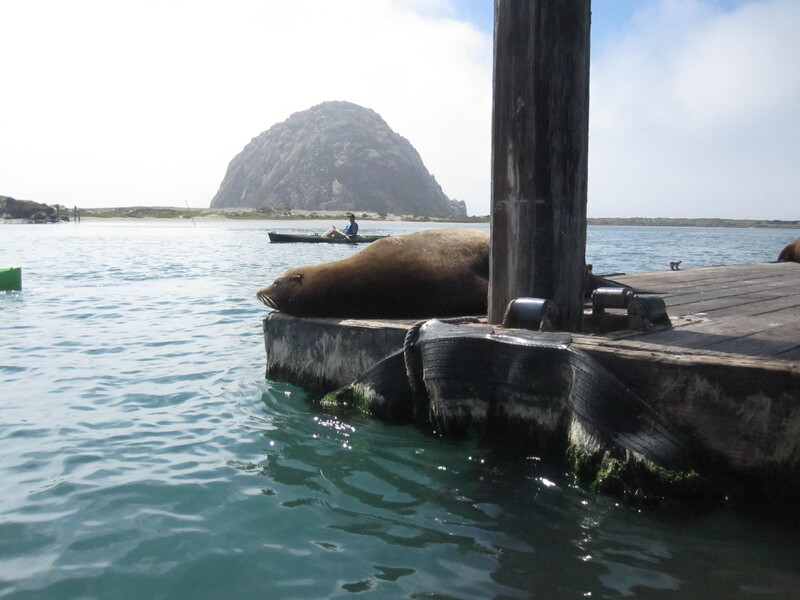 So, those plans fell through, but we decided to spend an afternoon in Morro Bay anyway. We arrived in Morro Bay around 12:30pm and immediately began looking for a place to eat lunch. After successfully finding a place (our only real objectives were a place with oysters and without a super long wait) and enjoying a delicious meal, we walked around town a bit and ultimately decided to kayak. It was cold, windy, and overcast when we arrived (you could barely see the famous Morro Rock), but it cleared up and was much warmer by the time we were ready to begin our kayaking adventure. We stopped at the first kayak rental company we saw and after checking their prices, we decided to go for it! The company was Rock Kayak Co., and it’s located pretty close to the tourist information center. The prices are $12 for the first hour for single kayaks ($8 for additional hours, and more discounts for longer rentals) and $20 for the first hour for double kayaks. Ryan, Ryan’s dad, and I each decided to go for a single kayak. Since all three of us had been before, we grabbed life jackets, were set us up with kayaks, received a quick overview of the bay, and pushed out into the water. 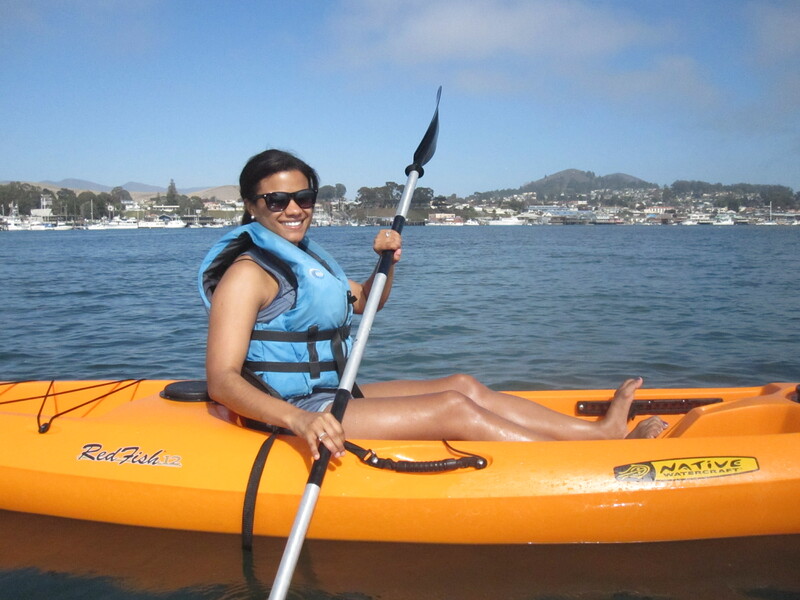 The Rock Kayak Co. does offer first timer lessons for anyone who hasn’t been before. The water was calm and we started out by heading across the bay to the sandy island. Unfortunately, the sand dunes were all roped off so we were only able to walk around a little bit. It was nice to enjoy the town of Morro Bay from across the bay! On the way to the sand island, we passed a platform in the middle of the bay full of sea lions. We got pretty close and one jumped in right in front of me. It was creepy because I didn’t know where he’d pop up (and I have no idea if they’re dangerous). Luckily nothing happened, and I was able to get a few close-up pictures! We kayaked away from Morro Rock and enjoyed the calm water. We weren’t sure how long we’d been out, so at one point we decided to turn around and head back toward the rock. It didn’t take too much effort to get over there, and we went around for a bit and eventually headed back to the starting point. Our adventure ended just over an hour after it began. We weren’t charged for the extra 5-10 minutes, which was nice! 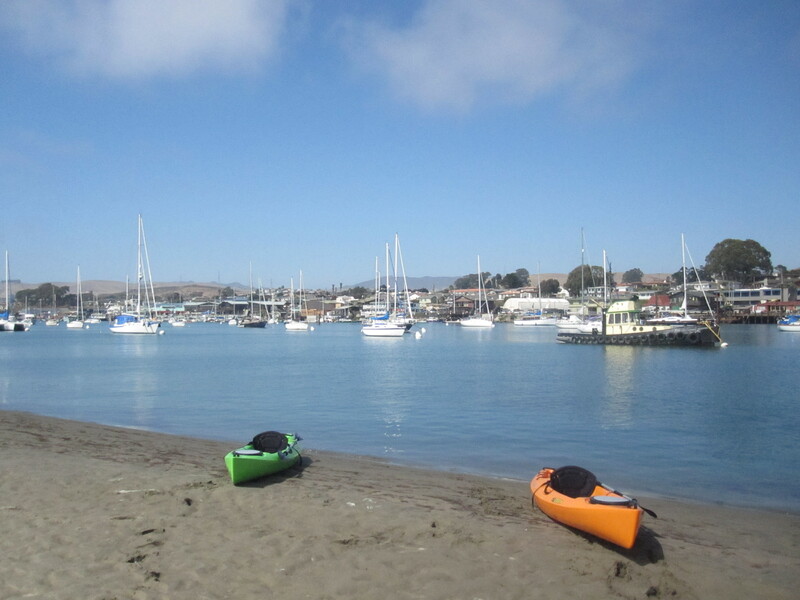 It was a great way to spend part of the afternoon and I would recommend it for anyone who wants to be a little active after a big lunch in Morro Bay. No need to plan ahead, just go down to one of the rental shops and get started in minutes! This entry was posted in Travel and tagged activities, California, Central Coast, Morro Bay, United States by Kristin. Bookmark the permalink.